Mardi Gras Celebration at Mintwood Place (1813 Columbia Rd NW) on March 4th: We will be open our normal business hours from 5:30 to 10:30 pm on the 4th. The band Nicky and the BoomBooms will be playing live at the restaurant. Cedric has created a New Orleans inspired menu, attached, available as three course for $35 or a la carte. The bar will be featuring classic cocktails menu like the Ramos Fizz, Sazerac, Hurricane, Absinthe Suissesse, Vieux Carre, etc. It should be a fun time all around. Laissez les bon temps rouler. Tap Takeover at Petworth Citizen 3/4 (829 Upshur St NW): Petworth Citizen & Reading Room is hosting a special event with Raven Beer/Baltimore-Washington Beer Works; a collection of Edgar Allen Poe-inspired craft brews. Beginning at 5pm on Tuesday, March 4th we’ll be serving: The Raven Special Lager, Tell Tale Heart IPA, Pendulum Pilsner, and The Cask Doppelbock. We’ll also be featuring some specialty beer cocktails. The Heights (14th and Kenyon St, NW) will offer Mardi Gras specials through Fat Tuesday (March 4th)!. Classic New Orleans cocktails (everything from the French 75 to the Hurricane) will be available all day. Del Campo (777 I St NW): On Sunday and Monday (March 2-3) Chicha Rosada cocktails will be $7 and representatives from La Diablada Pisco will be showing off traditional oversized carneval masks all night. Menu MBK (405 8th St NW): Menu MBK is selling individually sized king cakes in their market through March 4. The cakes are $4.50 each. Sticky Fingers (1370 Park Rd NW): The vegan bakery will be selling made-to order beignets on March 4 an 5. They come four to an order for $3.75. 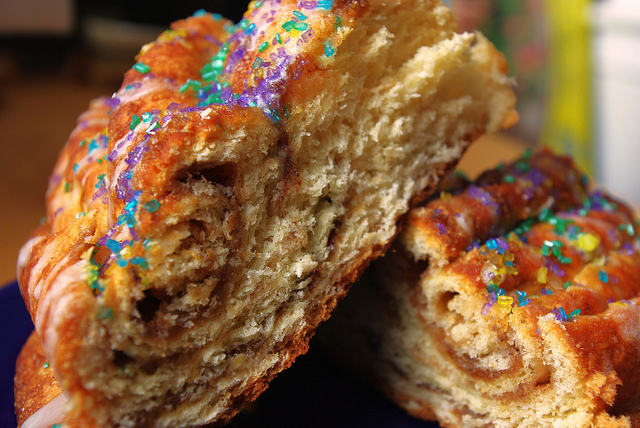 Sticky Fingers is also making king cakes that will be available from March 1 through 4. The cakes are available by special order and can be picked up in the store. They are $12.50 each and can be ordered by calling 202-299-970.